Enter the e-pop-in. The brand gets full creative control of a presentation of product samples in a location frequented by solid traffic, along with an incentive for the customer to buy online. The best part — it’s efficient and within budget for emerging brands. 1. Think of service providers as the location to create the e-pop-in. They already have a relationship with the customer, yet aren’t selling competing merchandise. For example, if you’re a fashion orthodics brand, get your e-pop-in into podiatry offices. This is particularly suitable for Aetrex, which has developed a line of fashion orthodics footwear and can benefit by following the trail blazed by Vionic. 2. Think about strategic synergy. In other words, make sure the service provider’s brand message is in sync with your own. For example, a line of activewear that can also be worn to the office is strategically aligned with a personal training regimen like Inform Fitness that’s brief and efficient (covers all muscles intensely) and doesn’t even require a shower. 3. Try to align your brand with a growing industry (e.g., wellness). This would include massage spas, personal trainers, fitness in general, acupuncture, yoga, meditation, nutrition, physical therapy and psychotherapy. The prevention rather than the treatment of disease is becoming increasingly mainstream. 4. Ensure that the service provider’s customer profile matches yours. If your demographic, for example, is an over 50s wealthy client, be sure to partner with a service provider that has the same demographics. 5. Engage a partner whose key service is to create, produce, install and operate the displays, including refreshing them seasonally. Janet Valenza is president of Pop-Up Artists, a marketing agency for turnkey, short-term selling space. Janet can be reached at [email protected]. In a panel discussion at Retail’s BIG Show, LVMH North America’s Gena Smith, Nordstroms Rack’s Paige Thomas sat down with HSN’s Sandy Soto speaking about the increase of challenges retailers face in bringing newness and inspiration to the shopping experience. These challenges have put new pressures on the retail merchandising department, where concerns lied mostly with product selection and visual presentation. Today, the top merchandising position has broader accountability and is heavily involved with talent development, change management and customer experience. ENCOURAGING DIGITAL DISCOVERY, IN-STORE AND ONLINEWe’ve seen that customers want to shop on their own terms nowadays, and as a retailer or brand you need to respect that,” PSFK Labs’ Scott Lachut said. That’s the thinking behind a push to bring shopping cart functionality to every online experience, from “buy” buttons on Twitter,image recognition features within apps andstreamlined purchasing from social mediaand mobile. The option to reserve products online for in-store or curbside pickup helps stores like Gap and Walmart give customers more control over delivery, too. What does the store do, beyond just selling things? PSFK Founder and President Piers Fawkes says the future belongs to retailers that transact in culture, experiences and relationships. Stores become hubs for communities of like-minded consumers, with services and experiences beyond products. Club Monaco’s Manhattan flagship store is home to a bookstore and coffee shop; Urban Outfitters’ Herald Square concept store offers salon services, bike repairs and Instagram photo printing. Warby Parker takes it a step further with a unique theme at each new location — retro classroom décor in Dallas, a photo studio in Chicago and a reading nook in San Francisco. To stay ahead of consumers, Smith says general merchandising managers and their teams need to understand and appreciate how quickly technology is changing and channels are converging. What’s more, Smith says, cultural sensitivity and an awareness of what’s going on around the world — not just in selected markets — is also critical in retail. It takes more than tech skills to bring “Future of Retail” ideas to life; merchandising teams must also have a deep understanding of how customers are living their lives. Verizon Wireless is reinventing the traditional in-store experience with the transformation of their 1,700 stores to “Smart Stores. The store concept is set to provide an engaging, hands-on environment to better serve, and most importantly educate customers on how to integrate technology into their daily lifestyle. After listening to customer feedback, Verizon is integrating real-life situations into the store setting, enhancing the learning and purchasing experience for customers as they can relate to in-store exhibits. Verizon envisions each customer leaves completely satisfied and educated on how everyday activities can become simplified and enjoyable through the connection of their mobile devices. 1) Hosted Wireless Workshops —the free, fun hour-long classes help customers understand how to get the most out of their iPhone, Android, and Tablets. 2) Elimination of traditional store layout – no more counters and browsing through a wide selection of products. 3) Zone dedicated to showcasing lifestyles, such as fitness, music, home monitoring and mobile for businesses. Smart Stores will be managed more efficiently with in-store technology. Appropriate employee scheduling and new training material will be shared during store meeting sessions—reducing customer wait-time. Bill payment kiosks installed will give customers a convenient way to pay their bills into store without help from a store representative. Verizon Wireless is also up-to-date on the latest fashion! The employees’ wardrobe has been revamped and features diverse gear that allows them to personalize their look to reflect their individual style. “Creating the best customer experience – at every touch point – is our goal as we reinvent retail,” said Domenico D’Ambrosio, executive director national retail operations at Verizon Wireless. Retailers have been trying to implement RFID tags for over 10 years. Retailers such Wal-Mart and JCPenney have tried to put RFID tags on merchandise but fell short because of costs and smart shoplifters. Zara has learnt from others mistakes and is rolling out the technology in a 1,000-stores by the end of this year, according to the Wall Street Journal. For more than a decade, radio frequency identification chips were touted as a game-changer for retailers. But when they tried to apply the inventory-tracking technology, merchants such as Wal-Mart Stores Inc. WMT -0.68% and J.C. PenneyCo. JCP -0.49% discovered that what looked good on the drawing board didn’t always work so well in warehouses and stores. Penney, for instance, started attaching RFID chips to merchandise in 2012, but the radio signals interfered with existing anti-theft sensors. Penney removed the anti-theft sensors, but thieves caught on and shoplifting surged. The company scrapped the project. 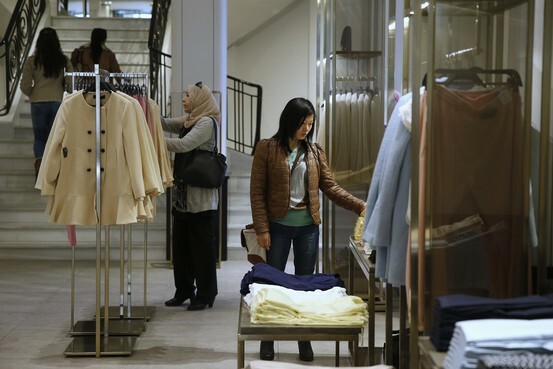 Now, apparel powerhouse Inditex SA, ITX.MC -0.22% parent of the Zara chain, says it has learned from competitors’ experience and is rolling out RFID technology throughout the operations of its signature brand. The chips, about twice the size of a standard mobile-phone SIM card, help the world’s largest fashion retailer keep better track of its stock and replenish its clothing racks more quickly, said Pablo Isla, chairman and chief executive of Inditex, which reports first-half results on Wednesday. RFID chips can store information about whatever item they are attached to and, when prompted, emit that data via radio signals to a scanner. Inditex is burying the chips inside its garments’ plastic security tags, an innovation that allows the “fast fashion” chain to reuse them after the tags are removed at checkout. The scale and speed of the project is drawing notice in the industry. The Spanish retailer says it bought 500 million RFID chips ahead of the rollout, or one of every six that apparel makers are expected to use globally this year, according to U.K.-based research firm IDtechEX. Inditex began experimenting with RFID in 2007. Mr. Isla asked his engineers and logistics experts to figure out how to reuse the chips—a solution that would minimize costs and ensure that the tracking devices wouldn’t follow customers out the door, a concern among privacy advocates. 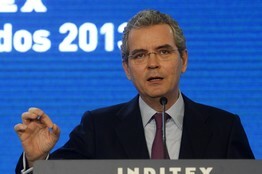 A breakthrough came during a brainstorming session at Inditex headquarters in northwest Spain, Mr. Isla said. An employee suggested putting the chip inside the slightly larger security tags Zara attaches to each item, a combination that experts in the field say no other large company has used. The security tag’s plastic case would protect the chip, allowing for reuse, and it would be removed at checkout. And each time a garment is sold, data from its chip prompts an instant order to the stockroom to send out an identical item. Previously, store employees restocked shelves a few times a day, guided by written sales reports. If a customer can’t find an item—say a medium-sized purple shirt—a salesperson can point an iPod’s camera at a barcode of a similar item and, using data gathered by the chips, see whether it is available in the store, in a nearby Zara store, or online. Some early adopters got only limited payback from investment in RFID. Early last decade, Wal-Mart pushed its suppliers to put chips on cases of items or stacks of cases, rather than on individual items. Wal-Mart scaled down the project after suppliers complained about the high cost of the technology—a problem Inditex doesn’t face because it manufactures its own clothing. But the technology has slowly been catching on. In the U.S., Macy’s Inc. said this week it would expand use of RFID tags after tests showed they helped improve sales, margins and markdowns. Other European retailers have recently embraced the tracking technology. France’s Oxylane Groupe, owner of sporting goods chain Decathlon, said it will put hundreds of millions of RFID chips on goods it sells. U.K.-based Marks & Spencer, MKS.LN -0.39%which specializes in clothing, home products and luxury food items, said it plans to track everything it sells. Bill Hardgrave, dean of Harbert College of Business at Auburn University and a consultant on RFID, said his retailer clients have boosted sales between 2% and 30% after installing tracking devices. Traditional retailers usually know where 60% of their inventory is at any time. With RFID technology, accuracy levels exceed 95%, he said. “Zara might not be the first, but when they implement a new technology, they do it so well that they catch up very fast,” said David Frink, chief technology officer at German clothier Gerry Weber International AG, one of the first retailers to put RFID chips on all its products. Online shopping is the future. So why do so many Web retailers want to be in stores? Over the past 18 months many web retailer pioneers, like Warby Parker and Birchbox, have discovered the old school benefits of opening up brick-and-mortar stores. According to the The Washington Post, “Having the opportunity to touch and feel our product is a big value,”co-founder of BaubleBar Daniella Yacobovsky said. While online shopping is becoming more popular, e-commerce still comprises a relatively small share of total retail sales. When online jewelry shop BaubleBar opened a brick-and-mortar outpost in Manhattan, the retailer quickly realized just how different its in-store shoppers are from its Web customers. Shoppers suddenly paid more attention to un-flashy pieces often overlooked online. More women bought multiple necklaces that could be worn together. And perhaps most importantly, co-founder Daniella Yacobovsky said shoppers typically purchased three times as much merchandise as an online BaubleBar customer. “Having the opportunity to touch and feel our product is a big value,” Yacobovsky said. After three years as an e-commerce darling, BaubleBar and many other Web retailing pioneers have discovered the old school benefits of having a brick-and-mortar store. Rent The Runway, which rents designer clothes by the day, plans to open a standalone store in Manhattan’s Flatiron district in September. Products from Etsy, a dominant online marketplace for handicrafts and vintage goods, will soon be available in independent boutiques and some major chain stores such as Nordstrom. Birchbox, thesubscription service that delivers beauty products to customers’ doorsteps, opened a brick-and-mortar flagship in New York in July. Upstart online retailers have emerged as a major challenge to traditional outposts such as Wal-Mart and Best Buy. But many of these sites are looking for new ways to distinguish themselves amid the flood of competitors while growing their businesses at a time when e-commerce still comprises just a small portion of overall retail sales. Now, many are taking a page from their traditional competitors by offering an in-person shopping experience that can’t be mimicked on a tablet or smartphone. When shoppers have a chance to test or try on clothes and other merchandise, they don’t have to agonize over a picture online and wonder whether it’s worth the investment. This heightened focus on in-store experience could be a sign that the retail industry definition of successful store is changing, analysts said. Harry’s, the online seller of high-end men’s shaving products that recentlyraised $123 million in venture capital funding, set up its first brick-and-mortar outpost last year in New York’s SoHo neighborhood. Instead of launching a traditional store that sells its razors and shaving creams, the company built a barber shop that co-chief executive Andy Katz-Mayfield said is designed to feel like a neighborhood store. Using a physical space to create a memorable, one-of-a-kind experience is core to what many online retailers’ say motivated their move into physical stores. Jennifer Hyman, chief executive of Rent the Runway, said shoppers at the company’s brick-and-mortar shops are able to get special touches not available online — including temporary hemming or strap adjustments as well as stylists’ advice that might steer them to new brands. After launching a men’s apparel online retailer in 2007, Bonobos has found its physical stores essential. Known as Guideshops, the tiny showrooms allow customers to try on blazers, suits and dress shirts. That is key for Ross Martin, 27, who stopped by a Guideshop in Georgetown this week to make an emergency purchase of a suit for a wedding this weekend. His other suit was ruined at a wedding the weekend before and he needed a new one in a hurry. “I went online to look at their offerings, but I’ve always had trouble finding brands that fit,” Martin said. By coming into a store, Martin said he felt more confident that he’d get something quickly that met his needs. Guideshops have a small real estate footprint because they only carry one of each item in each size. Customers try on the clothes, then place an order online with the help of a sales associate. Within two days, their purchase arrives at their doorstep. Bonobos announced in July that it plans to open 30 more Guideshops by the end of 2016, a move that will quadruple its store count. Transactions at Guideshops are double the average value of an online order. The company sells twice as many suits in Guideshops as on the Web and 50 percent more dress shirts. The company has slashed its online marketing costs in half as purchases have increased at the Guideshops. Some online retailers have pushed into brick-and-mortar spaces by partnering with existing stores. Etsy has set up a wholesale marketplace that connects boutiques and chain stores with Etsy sellers. The company will collect a 3.5 percent fee from retailers for each wholesale purchase order. In some cases, in-store displays feature Etsy branding. BaubleBar has launched partnerships that allow its merchandise to be sold in Nordstrom and Anthropologie. They’ve recently closed the New York store at their corporate headquarters (“We’re growing, we need the office space back,” Yacobovsky says), but the outpost was pivotal in helping the brand develop its strategy for brick-and-mortar shopping. Yacobovsky says they are continuing to look at other opportunities for selling goods offline, which may include standalone retail outposts. Simeon Siegel, a retail analyst for Nomura Securities International, said that Web-first retailers may be on the leading edge of redefining how the retail industry thinks about success at brick-and-mortar outposts. “Sales per square foot used to be the most important metric, and you’re now hearing managers shy away from that,” Siegel said. In other words, the success of a store may judged less on how many dollars it pulls in and more on its ability to function as a marketing tool for the brand. The traditional grocery store model is seems to be out the door in the UK. This week German discount supermarket, Lindl, will offer “high-end, on-trend” mainstream fashion apparel. Yes, that means when getting milk at your local Lindl store, you can also pick up a leather-trimmed jacket for £14.99. The clothing line is Lidl’s latest effort to draw in new shoppers as it targets avenues of expansion in Britain. German discount supermarket Lidl is moving into mainstream fashion as it steps up pressure on the UK retail establishment. After successfully challenging the big supermarket chains on food, the retailer will sell its new womenswear range from next Monday – including a bargain-priced leather-trimmed jacket for £14.99. Shoppers will be able to pick up stretch jeans for £6.99, ankle boots for £9.99 and shirts for £5.99 with their groceries. A menswear fashion collection will follow in November. Lidl’s move into what it describes as “high-end, on-trend” mainstream fashion is a contrast to its previous clothing launches, which focused on cheap but basic garments such as underwear, vests and childrenswear. The new fashion range will be sold in the same way as all its non-food items: while stocks last. The clothing line is Lidl’s latest effort to draw in new shoppers as it targets avenues of expansion in Britain. The chain has already drawn in a wider demographic by stocking more fresh British meat and vegetables and freshly baked breads, offering luxury foods such as lobster at Christmas and introducing a range of fine wines. A combination of the newer items and low prices is winning over shoppers from traditional supermarket chains such as Tesco and Morrisons and even Waitrose. The unbranded clothing range – manufactured in China and Bangladesh – will compete head-on with Asda’s hugely successful George brand, Tesco’s F&F and Sainsbury’s Tu, as well as discount clothing specialist Primark. She said the highlight of the collection was the “leather” jackets – two in faux leather and a biker-style design with leather piping – which will go on sale at £14.99 each, cheaper than the faux-leather jackets on sale at the major supermarkets or even low-price specialist Primark. Also in the collection are skinny cut, cotton jeans made priced at £6.99, denim shirts in a light or dark wash and a chiffon shirt all for £5.99 each. Heeled ankle boots are available for £9.99 a pair. Lidl and its rival Aldi sell small amounts of clothing but are growing rapidly in Britain as they take on the big supermarkets. According to the latest data from Kantar Worldpanel, Lidl increased sales by 19.5% year-on-year in the 12 weeks to July 20. Its market share of grocery spending now stands at a record 3.6%, compared to 3.1% a year ago. But Richard Perks, director of retail research at market research group Mintel, cautioned: “This is taking what they are doing already and moving it on a step. This is about value for money and is about offering some excitement to the opportunistic shopper with a relatively small range that will probably sell very quickly.”Lidl, owned by the Schwarz Group, has ambitious plans for the UK. UK managing director Ronny Gottschlich has said grocery shopping in the country is entering a “new era” and pledged to grow Lidl from 600 stores to as many as 1,500. The chain now attracts up to 5 million shoppers a week and Gottschlich says new customers quickly become converts. He plans to open up to 40 new outlets a year – up from 12 last year – and believes that as the German chain makes its efforts to “become more British”, shoppers will stick with Lidl even as the economy improves. • This article was amended on 22 August 2014 because an earlier version referred to Lidl’s fashion range being sold “until stocks last”. This has been corrected to say “while stocks last”. There are plenty of point-of-sale providers retailers can choose from — but not all POS systems are created equally, and not all have the features that can actually better your business, in terms of improved customer convenience strategies that also deliver on your business needs and goals (including those in multiple channels) at any given time. Here are a few key features all retailers should look for when choosing a POS system. Consumers are becoming increasingly comfortable with the idea of using a mobile device, including smartphones and tablets to perform the same functions that fixed or desktop systems have traditionally provided, including checking and opening emails, online research of product information — and completing purchases. Given that major retailers like Apple, Nordstrom and Urban Outfitters have already begun to execute their own iterations of what the new mobile retail experience will entail, retailers of all sizes should be prepared for changing customer expectations, including being “met” by the retailer as part of the purchase and checkout experience. When you choose POS technology equipped to work as a mobile device in tandem with a traditional fixed POS system (and those systems “talk” to one another), you equip your customer service team to act as a mobile checkout resource from anywhere in the storefront, with the aid of a mobile point-of-sale checkout system. The “check out anywhere” capability not only improves the customer experience; it optimizes your company’s investment (and ROI) in staff’s time, and minimizes the risk of lost sales that can result when customers forgo making a purchase because of long checkout lines. Real-time inventory management isn’t just a way to optimize your cash flow and stock on hand. Customers now expect that a retailer knows and shares exactly what is in stock at any given time, and they use that information as part of their purchase decision process. According to a January 2014 study published by Accenture and Forrester Research, 71 percent of consumers expect to view in-store inventory online; 50 percent expect to be able to buy online and pick up in-store. You don’t have to be a behemoth retail outfit to replicate the real-time inventory and supply chain controls (that have made brands like Wal-Mart leaders in the industry) to deliver on this expectation, but you do need a POS system specifically equipped to provide real-time inventory management (particularly if you’re an omni-channel retailer with multiple storefronts and e-commerce channels). Select a system that allows you to balance stock across locations, enter purchase orders, receive inbound inventory and assign barcodes to new products for anywhere — including a till, back office and a mobile device. With such real-time inventory management and response capabilities, you achieve improved internal controls — and a competitive advantage: Despite customer expectations, Accenture estimates that only a third of retailers have operationalized real-time inventory management at even a basic level. The capability to offer appropriate customer promotions based on the unique goals, performance history and inventory levels across multiple locations in your retail operation can be a complex matter that not all POS systems are equipped to handle. When you choose a POS system specifically designed to accommodate multisite operations, you can target customers based on their purchase and promotional redemption history while taking into account the unique business needs of each of your retail locations at any given moment. With such a POS system, for example, you can design unique offers for specific customer segments, at the times specific retail locations need the most sales support. For example, you might message staff through your POS system to “upsell” loyal VIP customers with a limited-time discounts valid at defined locations, during slow hours of operation. Once a specific sales threshold is reached, you can expire the promotion in the POS system, on a location basis. A point-of-sale system is much more than a way to process customer transactions, collect sales data and manage inventory. When you choose a POS specifically designed to improve your existing internal processes and customer offerings, you don’t just find a way to conduct “business as usual” — you can leverage new opportunities to strategically optimize every function of your retail business, from the inside out. Tim Flachman of Bepoz America is a POS expert who writes about topics including event technology, retail software, entrepreneurship and more.